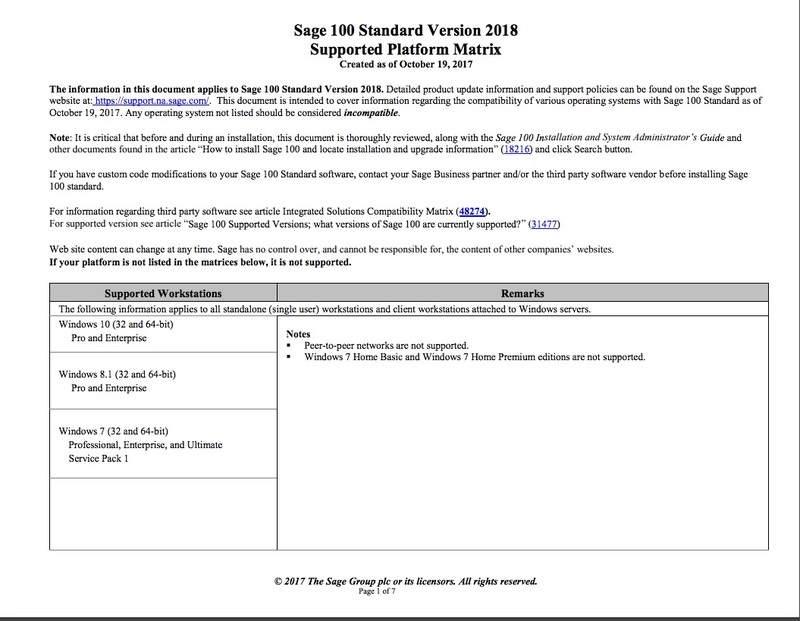 Sage just updated their Supported Platform Matrix to include their latest Sage 100 2018 release. Sage provides a PDF download for each version of their Sage 100 supported versions (Standard, Advanced, Premium). These PDF files outline the acceptable hardware, operating systems, and memory required for the proper operation of Sage 100. Please note, there are some configurations such as Windows XP on the desktop and Windows Server 2008 which not work with Sage 100. During the installation, if you are attempting to install to an unsupported version the install routine will stop and not allow you to continue. We recommend you review all system requirements far in advance of the date of your Sage 100 installation or upgrade.